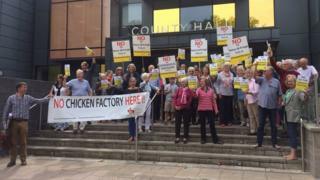 Campaigners have lost their battle against plans for a huge poultry factory in Wiltshire after the proposal was approved by councillors. The farm between Sutton Veny and Longbridge Deverill, near Warminster, will house nearly 180,000 chickens. Villagers say the factory will cause unacceptable levels of noise, smell and traffic. The company behind the scheme insists it will improve the local environment. Plans for a massive chicken farm on the site were first proposed in 2012 to replace a smaller, derelict factory. A decision was deferred by Wiltshire Council but a new application was submitted by Amber Real Estates Investment Ltd earlier this year. This company names one of its directors as Ranjit Singh Boparan, known as "The Chicken King" after founding the 2 Sisters Food Group. Four 100m-long buildings holding more than 40,000 broiler chickens were proposed on a site in an area of outstanding natural beauty about 150m from neighbouring homes. Wiltshire Council officers recommended it for approval, saying it "would not have an adverse impact on the character or appearance of the locality and in particular the Area of Outstanding Natural Beauty". But the plans have outraged residents living nearby, who formed the campaign group Spitting Feathers five years ago to fight the first proposal. They said the farm would cause "unacceptable" levels of noise, odour and traffic, citing the "nauseating stench which blighted the village when the previous small-scale chicken farm was running on the site". They were supported by Sutton Veny Parish Council which said: "Many villagers remember the pungent odour which blighted our village. "People were forced to close all their windows and remain inside to avoid the acrid, ammonia-laden odour." Amber Real Estates said the factory would "provide significant improvements both environmentally and aesthetically".